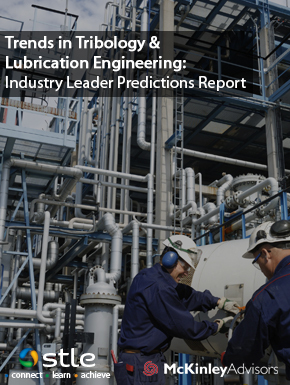 STLE’s 2017 Report on Emerging Issues and Trends in Tribology and Lubrication Engineering builds on a multiphase research effort to evaluate current trends and predict future developments impacting the field of tribology and lubrication engineering that was first conducted in 2014. Based on input from nearly 1,000 technical experts from the around the world, the Emerging Trends Report includes a look into more recent advances and topics that have surfaced since the publication of the original report. The 52-page report summarizes key findings that are divided into two sections: Field Discipline Areas and Field Issues, addressing important topics related to the field. Single print copies of the full report are available. Order a printed version of the full report by adding to your online cart. Please be certain your mailing address is correct in your record prior to ordering for fast processing. Shipping charges will apply. For multiple copies, please contact the STLE office to arrange order. A $15 fee is charged to cover postage and handling. For multiple copies please contact the STLE office to arrange order.